I normally don't keep track of the phases of the moon, but, on occasion it can get pretty obvious from the unusually high tides that we have a full moon. I took this photo of the marsh behind one of my Eastham listings this afternoon. From this vantage point you rarely actually see water. Not so today. Today was a bitterly cold, but clear, day here in Eastham. The snow is totally gone, but the constant breezes made for a windchill far below the 19 degrees. I was in the area, so I drove to the Fort Hill observation area to see what the marsh looked like. I believe that I could see a few seals in the water below, but I didn't have my binoculars with me and it was too cold to get close enough to be sure (wimp!). The photo below is of the Captain Penniman House. 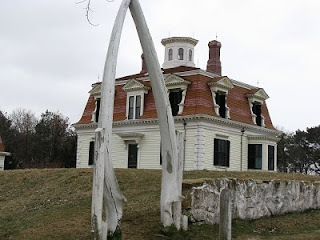 The entrance way is framed by old whale jawbones. The Captain Penniman house was built in 1868 by (guess who?) Captain Penniman. The story of the house can be found on the Cape Cod National Seashore website. Private mortgage insurance is unavoidable for some homeowners, but don’t pay PMI premiums a day longer than required by your lender. Read more.. Sometime in the near future the Fed will stop buying the much-maligned mortgage backed securities. Almost everyone agrees that the inevitable result will be an increase in the home mortgage interest rates, now hovering at the 5% level. Some feel that the increase will be in the 1% range (bringing the rates to the 6-ish % range). Others, including the linked article, say that the increase will be minimal, in the 0.1% to 0.15% range. Read the article on the Wall Street Journal's MarketWatch website. Yesterday it was Eastham; today it's Wellfleet. 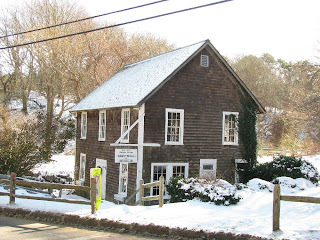 Cape Cod author, Christopher Setterlund, has a series of articles that he calls "In My Footsteps", one of which was about a recent visit to Wellfleet. Christopher visited several of Wellfleet's tourist locations, taking note of Wellfleet's raw natural beauty. Check out the article on the In My Footsteps blog. Would you prefer to own a brand new Cape-style home, on a large lot, close to Eastham's ocean beaches? A local builder is proposing to build one of 3 designs for you on the residential building lot at 900 Old Orchard Rd. The builder, Coastal Land Design (http://www.landcape.com) , is a local builder with many examples of their excellant work. The 'list price' for any of these homes built on the 40K+ sqft lot at 900 Old Orchard Rd is $595,000. Go to http://NewConstruction.RobertSheldon.com for detailed spec sheets for the 3 designs. 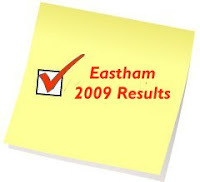 The Eastham sales data for 2009 reveals some very interesting observations. Go to my website's 2009 Sales page for the details. What we saw was that the number of sales was down 21% from 2008, the average home sale price was down 10.3%, and the median was down 12.7%. These stats are primarily the result of a near-total lack of buyers in the $450K to $600K home price range, the 'normal' middle space. I believe that these buyers are simply holding back, waiting for the economic "all-clear" signal, which I'm hoping will come early this new year. Further evidence of this void is that the median sold house size (in square feet) is down roughly 15%. 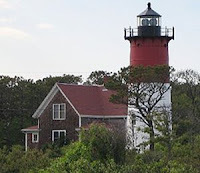 A much-published Cape Cod author, Christopher Setterlund, has a series of articles that he calls "In My Footsteps", one of which was about his recent visit to Eastham. Christopher visits a number of Eastham's tourist attractions and writes a very informative piece that is a good read for someone who wants to hit the high points. Check out the article on the In My Footsteps blog. Can you trace your lineage back to the Mayflower? Here's a website that has the complete passenger list for the Mayflower for its 1620 trip west to the Americas. This site also has some information on how to trace your descendants. Go Here .... Sail1620.org. Also, this site has a fairly complete listing of Pilgrim Memorials, including a page of Eastham information. New Listing - Fabulous Eastham Getaway - Move In! This home is that weekend getaway that you'll want to move to! What was once a small cottage is now a 2200 sqft masterpiece, being completely updated in 2003 with a to-die-for master suite with a luxurious master bath and private sunning deck, 2 additional guest bedrooms, screened-in porch, hottub, garage, delightfully decorated living space, separate dining area, and spacious kitchen. All this, away from all the traffic and just a short walk to South Sunken Meadow Beach. Listed at $649,000. Come see! Check out my website for more photos and a Virtual Tour. Call me at 508-237-9545 for an appointment. Should You Build vs Buy Your Vacation Home? This is certainly a valid question that, up to very recently, seemed to generally be answered 'Buy'. This question involves much personal thought and draws from previous personal experience and fear. More recently, the economic downturn has dropped both the prices of building lots and building materials, making the 'Build' option economically more attractive. I have 3 building lots, each 40K+ or 50K+ sqft, that are very attractively priced, that would make wonderful homes for your new home. I also have several builders that are able to build Cape-style homes at very attractive prices on your lot. Call me so we can discuss this option. Massachusetts law provides a mechanism for homeowners to protect significant equity in their homes from most creditors. A Declaration of Homestead, prepared for the owner, executed by them, and recorded at the Registry of Deeds in the County where they reside, provides the protection allowed by the statute. The Homestead Act allows homeowners to protect a total of Five Hundred Thousand Dollars ($500,000.00) in equity in their principal residence from attachment, levy on execution, or sale for payment. The filing fee with the Registry of Deeds is $35.00. There are exceptions and additional benefits for seniors and the disabled. Go Here for more information. Last year was somewhat of a challenge when it came to selling real estate here in Eastham. The 'middle space', between about $450K and $600K, seemed somewhat out-of-bounds to the buyers. Although they looked at homes, many simply decided that the economy wasn't right to be spending that much money on a discretionary expense, such as a summer or vacation home. If you'd like the 'whole' story, download a copy of my February newsletter...Here. The following chart didn't fit my newsletter. You can clearly see that the 'middle space', which historically has had the lion's share is largely missing. Ugh. 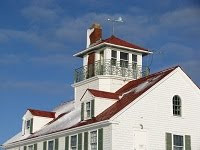 The restoration of the Long Point Lighthouse and its keepers' house is a project that's time has finally come, we think. This lighthouse is at the very tip of Cape Cod, in Provincetown. The lighthouse, hopefully, will be used for overnight stays, as the Race Point Lighthouse keepers' cottage is today. Read the story in the Cape Codder...Here. 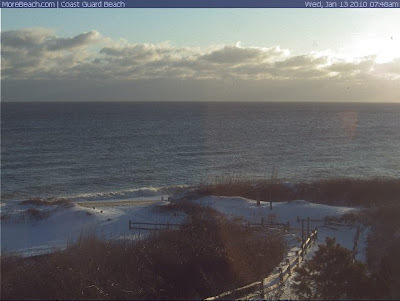 One of my readers emailed me about the towers she saw in the Coast Guard Beach in the webcam that I linked to a few days ago (check it out ...Here). Today I drove down to the beach to see up close what she saw. 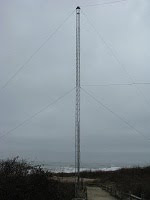 What surprised me was the sheer number of radio antennas that were on the bluffs and surrounding the Coast Guard Station. It turns out that Coast Guard Beach was the focal point for the annual celebration (on January 18th) of Marconi's first transatlantic transmission, 106 years ago. The antennas are used by ham radio enthusiasts in their celebration. The towers will be removed in the next few days, weather permitting. The photo, right, is the big tower that's visable from the webcam. My February 2010 newsletter is available now. This newsletter has my year-end 2009 real estate report for Eastham as well as my predictions for 2010. Also in this edition is an article about Massachusetts' Homestead Act, a discussion of the build vs buy 'question', and some reasonable office space in Eastham. Download your copy of my Eastham newsletter ... Here. I couldn't resist taking this photo. What do seagulls do on their day off? In truth, its difficult to tell, since they just hang out on their work days, too. This photo was taken in Eastham at the Main Steet Mercantile plaza. Today was a crystal clear day, about 35 degrees. A great day for ice fishing, if there's ice. Well, Ministers Pond, in Eastham, was covered over by about 6 inches of hard ice with an inch of light snow - Perfect! A friend of mine called me a suggested that I come to the pond and check it out. Just as I arrived one of the fishermen pulled this bass from the water. My guess is about 3-4 pounds. Today's picture is the sun rise over Coast Guard Beach, as taken by a webcam mounted on the Coast Guard station in the National Seashore. You can check out this webcam for yourself ... Here. 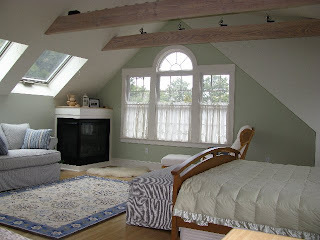 My fascination with the style that is called "Cape Cod Modern" is no secret. There are many of these homes scattered about Wellfleet, Truro, and Eastham. Some of these homes sit in federally owned land, and are federally owned, within the Cape Cod National Seashore. Through the hard work of a few dedicated folks, several of these homes are being 'saved' from ruin due to neglect. The first of the homes to be restored is the home known as the Kugel-Gips house, and has been recently restored. Check out the story on the Cape Cod Times website. 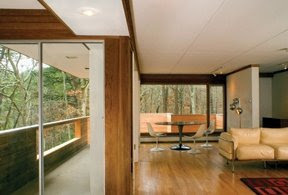 To check out my other posts on Cape Cod Modern ... go here. A day or so ago I had need to drive into Brewster to fetch a septic plan for a home that I am trying to sell. The route took me past the old (or is it olde?) grist mill on Stoney Brook Rd. I had never seen it after a snowfall, so it caught my eye. The current mill dates back to 1873, but the history of this mill site dates back to the mid-1600's. Check it out on the Town of Brewster website. 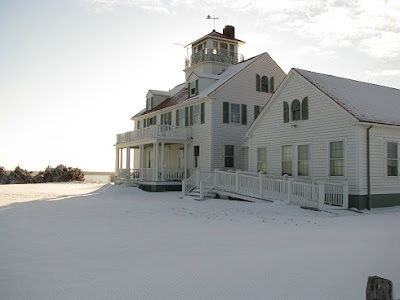 Way back in 1978, 32 years ago next month, the most famous beach house, the Henry Beston's Outermost House, was washed off Coast Guard Beach by a ferocious storm, known as the Blizzard of '78. While the Outer Cape didn't receive a lot of snow, it was hammered by exceedingly high seas and wave overwash. Watch this video to hear and see about the storm and the loss of Henry Beston's house from a few folks who saw it first-hand. Enjoy! 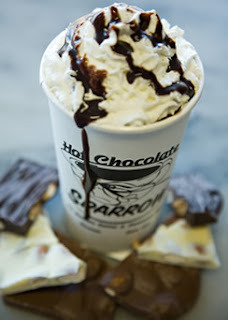 The Hot Chocolate Sparrow in Orleans has been a favorite haunt of my friends and clients for many years. The "Sparrow" is a coffeshop/candy store in Orleans, across the street from the Cape Cod Rail Trail bike path. When my clients want to look at homes in Orleans or Brewster, I try to meet them at the Hot Chocolate Sparrow in lieu of meeting at my office in Eastham. Well, the New York Times ran an article about the Sparrow this weekend that's a must-read. The coffee, hot chocolate, free internet, cafe tables, chocolate candies, and general friendly atmosphere make the Sparrow a natural success. Read the article ... Here. Also, the Sparrow has its own website... Here. 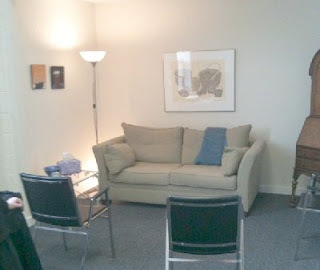 Are you in need of a private office in Eastham, or the Outer Cape? Do you need complete privacy to meet with clients, develop web applications, or run an internet business? I have a client with 3 offices, each approximately 200 sqft. They are clean, carpeted, sound-proofed, and have high ceilings. These offices include are all utilities (heat, lights, Internet), parking, and snow removal. Additionally, these offices share a waiting area and a rest room, not included in the 200 sqft. These offices are in Eastham's Brackett Rd commercial center and would be ideal for a writer, an analyst, or an attorney. These offices are available for $300/month. Flexible lease arrangements. Call me at 508-237-9545 for an appointment and to discuss your requirements. While exploring the far corners of the web, I encountered the adventures of a traveling moose, named Moose (seems fitting). The whimsical website follows the whereabouts of Moose, taking photos in front of local landmarks. 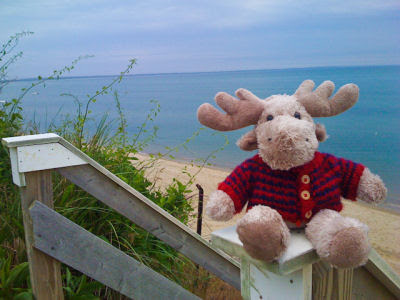 Well, last summer Moose came to the Outer Cape, as evidenced by the following photos. The first was in front of the Highland Light in Truro. The second appears to be at the top of the stairs at Nauset Light Beach in Eastham. 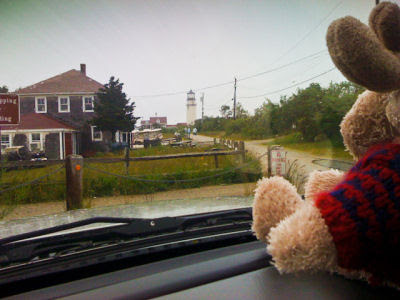 It also appears that Moose doesn't like to get wet - he stayed in the car while it rained at the Highland Light. Hmmm. Follow Moose at http://www.avermontmoose.com/. He'll be back this summer. I drove to Coast Guard Beach to see what yesterday's 10 to 12 inch snow fall looks like on the ocean. The bright sunshine, and above freezing temperatures, provided some stunning views. 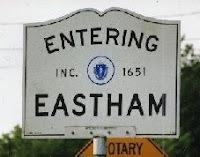 The preliminary results for home sales in Eastham are in! The sales volume picked up modestly, but still bringing the total 2009 sales seriously short of the 2008 sales. The facts..
A total of 9 homes sold in Eastham in December, compared to 6 in November. Total sales were roughly $4.3 M - the average home sale price was $476K. This is up 39% from the sales volume of November. The median sale price in December was $465K.